Mayor de Blasio has appointed two new members to the nine-member Rent Guidelines Board, a new chair and a new owner’s representative. The two appointments – new chair Kathleen Roberts, a former United States Magistrate Judge, and owner rep Mary Serafy – “have years of experience in both the public and private sectors,” the mayor said in a press release on Tuesday. The Rent Guidelines Board is responsible for determining rent increases for around one million apartments in the city each year, last year issuing its first ever rent freeze for tenants signing one-year leases. In an official statement, the mayor said, “Judge Kathleen Roberts has years of experience serving New Yorkers as a United States Magistrate Judge and Assistant United States Attorney in the Criminal and Civil Divisions. Likewise, Ms. Serafy is well-versed in the field of housing, planning and development in both the public and private sectors. Over 250 people showed up last Wednesday to a legal clinic held by the Stuyvesant Town-Peter Cooper Village Tenants Association, to have their questions answered about the recent round of golub notices and to learn about apartment succession rights. Aki Younge, a paralegal working on the community development project in the housing practice area for the Urban Justice Center, offered general information about the two complicated legal topics while four lawyers from the UJC were available for individual appointments to meet with tenants about their specific concerns. The meeting, held in the auditorium at Simon Baruch Middle School, started at 6 p.m. and TA President Susan Steinberg said that they ended up having to schedule the appointments right at the beginning of the meeting because about 30 people had requested a slot with a lawyer. Councilmember Dan Garodnick, who was also in attendance, recalled that this kind of meeting was a much more common occurrence during the days of Tishman Speyer. Despite the frequency of building owners using specific legal issues against tenants, Younge explained that the rules are not intended to be malicious. Following a spate of residents being faced with primary residence challenges while some others have recently been denied succession, local elected officials and the Stuyvesant Town-Peter Cooper Village Tenants Association have announced they would be hosting a legal clinic on both issues. The event will take place on Wednesday, August 19 from 6-7:30 p.m. at MS 104 at 330 East 21st Street and will be co-hosted by Council Member Dan Garodnick, Congresswoman Carolyn Maloney, Borough President Gale Brewer, State Senator Brad Hoylman and Assembly Member Brian Kavanagh. Attorneys from the Urban Justice Center will also be present. As Town & Village reported in late July, the Tenants Association had noticed an uptick in Golub notices or notices of nonrenewal being issued due to primary residence challenges. As of July 30, TA President Susan Steinberg said she knew of seven new Golubs being issued. However, she noted, this was nowhere near as many as had been sent out at one time during the Tishman Speyer era of Stuyvesant Town. The former owner eventually managed to serve over 1,000 tenants with Golub notices. Tenant advocate groups have a message for landlord who harass tenants: You’re being watched. 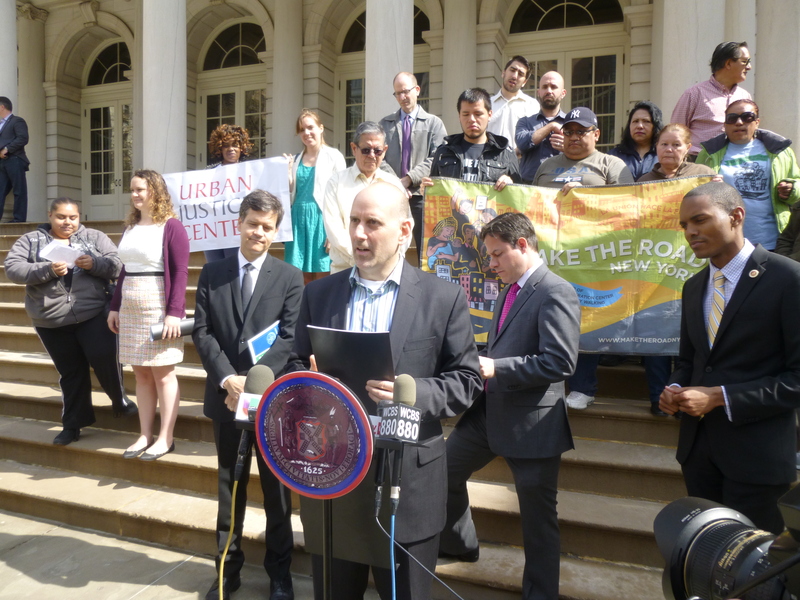 At a press conference last Thursday, the advocates and elected officials said that they have identified predatory equity landlords who tenants say have been mistreating them and forcing them to live in hazardous conditions. 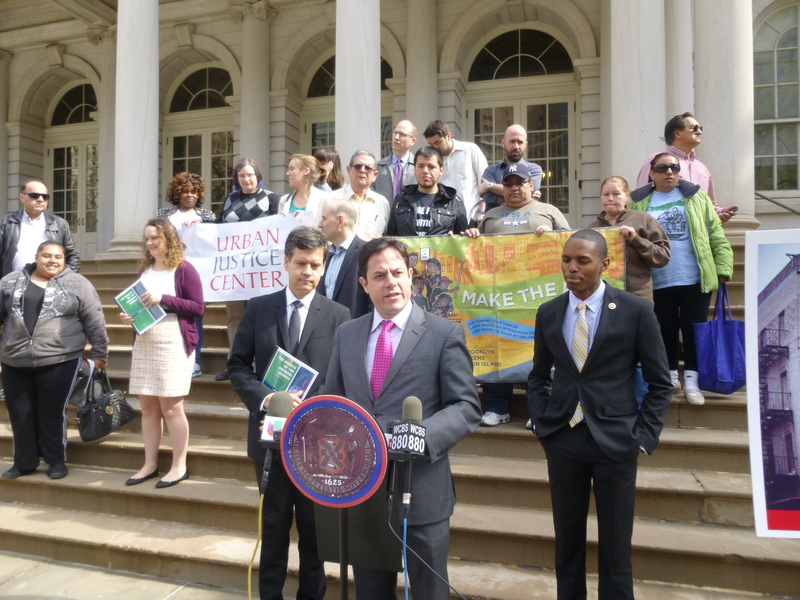 Councilmembers Dan Garodnick and Jumaane Williams, who formed the Coalition Against Predatory Equity last year with Councilmember Ritchie Torres from the Bronx, were at the event. “We now have names attached to these situations so they know we’re going after them,” Williams, chair of the Council’s Housing Committee, said. The landlords that have been singled out are Alma Realty Corp., Benedict Realty Group, Coltown Properties, Icon, SMRC Management, Steve Croman and Ved Parkash. Various tenants from buildings owned by these landlords were at the event, including residents of 444 East 13th Street, who recently filed a lawsuit against their new management company with the help of the Urban Justice Center because they have no gas or hot water and the management company has been doing construction despite a stop work order from the Department of Buildings. With Mayor de Blasio expected to unveil a housing plan soon that’s supposed to create or preserve 200,000 units of affordable housing, Council Member Dan Garodnick has released a report that’s determined a part of the plan to maintain the city’s stock of affordable housing needs to be a crackdown on predatory equity. Garodnick discussed the issue in front of City Hall on Tuesday, saying that even after the market crashed, landlords have continued to accrue excessive debt in building purchases and then attempt to either pass the costs on to tenants in ways that are sometimes illegal or become slumlords. Meanwhile, since then, there have been similar deals that have been even worse in terms of those properties being allowed to deteriorate. Such blighted properties, noted Garodnick, are a burden on the city. He also referred to the refinancing last week of the 1,600-unit Three Borough Pool, which was $133 million in debt. After being refinanced, the property’s debt has swelled to $146 million, which Garodnick said makes no sense. In his report, titled “Ghosts of the Housing Bubble; How Debt, Deterioration and Foreclosure Continue to Haunt New York After the Crash,” Garodnick suggested a few policy changes to deal with properties that are overleveraged. One is to have the city invest much more in Alternative Enforcement Program, which allows the city to repair violations and bill the owner. The city currently only spends $50,000 on the program, relying on federal grants to make up the rest of the $7.6 million budget. Another plan is to give good-acting landlords the first chance to buy foreclosed mortgages after the city buys them. He also said he would look into the possibility of “creative solutions” where long-suffering tenants being able to get a crack at buying. He noted how this was currently a goal in ST/PCV, though in that case, the proposal to buy was not organized with assistance from the city. Another of his recommended changes is to create new standards for receivers or debt servicers to make sure they are protecting the health and safety of residents. Currently, receivers can’t be sued in Housing Court without approval of the Supreme Court judge who appointed them. Finally, Garodnick also recommended creating new state guidelines around the existing federal Community Reinvestment Act, which pushes banks to lend in low-income areas. The idea there is to focus on the quality of loans, not just the quantity. Along with those proposals, Garodnick also discussed new legislation that would make the Department of Housing Preservation and Development (HPD) create a watch list of owners who engage in predatory equity. The bill was authored by Council Member Ritchie Torres, who represents a district in the Bronx where the practice has become increasingly common. While at City Hall, Torres said that at this time, “There are no consequences” for owners who engage in “intentionally harassing, defrauding and displacing tenants from their homes.” He, along with State Senator Brad Hoylman, said he supported Garodnick’s proposals, and Hoylman said he would address them at the state level. A couple of tenants then shared tales of living in buildings that were so poorly maintained, the only ones who seemed to be in control were the rats and drug dealers. Tenant rep Harvey Epstein has been reappointed. Only a few hours before it was scheduled to meet last Thursday, Mayor Bill de Blasio appointed four new members to the Rent Guidelines Board, which is responsible for setting the rent on about one million rent-regulated apartments throughout the city. Mayor de Blasio appointed two public members, a tenant representative and an owner representative. He also reappointed tenant representative Harvey Epstein. The chair’s seat has not yet been appointed and four other seats on the board will open up at the end of this year. The board is comprised of nine members, all of whom are appointed by the mayor, making it one of the few tools he has to directly influence the cost of housing. There are two landlord representatives, two tenant representatives and five public members, one of which includes the chair. Cecilia Joza and Steven Flax were appointed as the two new public members. Joza is currently the housing counseling program director at Mutual Housing Association of New York, a not-for-profit housing organization that owns and manages over 1,200 affordable rental apartments in New York. She facilitates and conducts home purchases for first-time homeowners and offers foreclosure and predatory lending prevention counseling. Flax has been involved in promoting community-based housing and development for the last few decades. He is currently a vice president of community reinvestment at M&T Bank and oversees community development lending. De Blasio also appointed Sheila Garcia as a tenant representative. Garcia is currently the community organizer at CASA New Settlement, a not-for-profit, mixed-income housing and community-service organization the Bronx, where she works with community residents to improve living conditions and maintain affordable housing. Sara Williams Willard, who works at Hudson Companies as a senior project manager running the company’s activities on Roosevelt Island, was appointed as an owner representative, replacing Steven Schleider, who often appeared unfazed by the booing at public meetings that would drown out his calls for maximum rent increases. The mayor also reappointed Harvey Epstein, who has been on the board since last April and called for a rent freeze before the board’s vote last June. 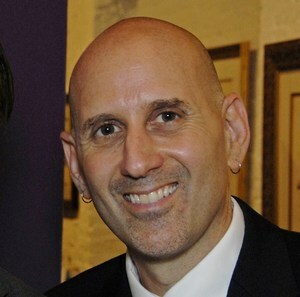 Epstein is project director of the Community Development Project at the Urban Justice Center and represents member organizations in litigating housing, health and consumer matters. Several years ago he ran a hotline for tenants that was mostly called by Stuyvesant Town residents who were facing primary residence challenges. Tenant advocates have responded positively to the new appointments, hoping that the new members will help sway the vote towards a rent freeze, which was also a campaign promise of then-public advocate de Blasio. Susan Steinberg, chair of the ST-PCV Tenants Association, indicated that she was cautiously optimistic. “While the devil is in the details and I would prefer to reserve my judgment for the actual vote on rent increases this summer, I am encouraged by the fact that the new appointees for the most part seem to have solid background in community development and affordable housing and would, presumably, understand the challenges faced by rent-burdened tenants of moderate means,” said Steinberg.